Rechargeable LED Lighted Beanie Just $11.99! Down From $25! 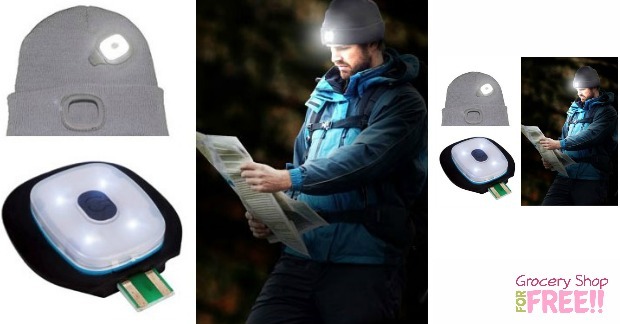 You are here: Home / Great Deals / Rechargeable LED Lighted Unisex Beanie Just $11.99! Down From $25! Rechargeable LED Lighted Unisex Beanie Just $11.99! Down From $25! I LOVE this idea! This beanie has a rechargeable bright light in it! You just pop it in your computer to recharge it, too! You can get this LED Lighted Beanie For Just $11.99! Down from $25, right now! This has so many great uses, and it would make a great gift! In fact, you can get 2 for just $20! Winter is quickly approaching meaning we’ll have to dawn a lot more clothing to stay comfortable outside and a lot less light in the evenings. With these lighted LED beanies, you’ll be completely prepared for those chilly and dark winter nights! Perfect for jogging, walking the dogs, yard work, you name it! Each charge last up to 4 hours and when the battery goes dead you can just plug it in to any USB port and soon it’ll be ready to go again! The light features 3 brightness settings and one touch operation. Be completely prepared for those chilly and dark winter nights! Perfect for jogging, walking the dogs, yard work, you name it!